October 8, 2012 by petersat. Filed under cs491 mobile, fall 2012, postmortems. 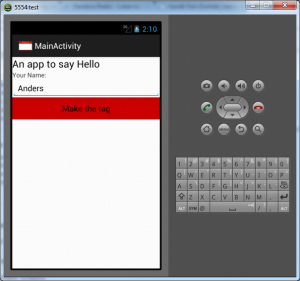 For my U and I assignment I decided to make an app that simulates the ‘Hello my name is…” name tags. Basically the app has an initial screen that takes in the name that you would like displayed on the on the name tag and after the user taps the button named ‘make the tag’ it will make the tag in a new activity. I also implemented the speaking system of android and added a button bellow the name that will speak the name that is displayed when it is pressed. 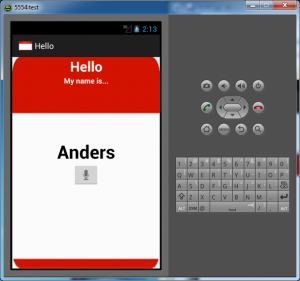 The app uses TextView, EditText, Button, ImageButton and inner voice application of android. Much of what I worked on in this app dealt with what I had already learned so it was a good chance to brush up and more familiarize myself with programming in android. I did learn though that when you change the language of the phone it will automatically change the built in voice system that my app used to speak the name. This project was fun to work on and I hope to someday have an android phone that I can put this app on.